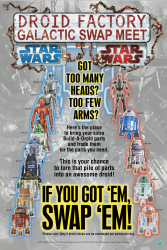 "I am an avid fan and love my astromechs! I stopped out at WDW Hollywood Studios today and happened to browse by the Droid Factory counter at Tattooine Traders. Not expecting to see anything, just more of the mismatched 2015 domes series when I did see exactly that!! More mismatched domes and some that I had not seen before. I have not seen reports of these new additions. I found 4 new domes, but nothing new in the legs or bodies from before. Maybe they are on their way? Or maybe 4 domes is all there is?? Not sure when these hit the retail floor, but it looks like there are new parts coming for 2016. The 4 different domes are pretty evenly distributed out there, no shortage that I could tell. Just wish they had some matching parts to make coherent looking droids. Most interesting is the new black R4.5 [?] dome. If I learn more here I’ll send it in." UPDATE: Disney has decided they still love you and this will not be a 6,000 piece limited edition. If you don't like buying a toy without anxiety, we're happy to share this story from Vinylmationworld.com. R2-D60 celebrates 60 years of Disneyland with a $13 figure made of build-a-droid parts that is limited to 6,000 pieces - a low number but not tiny. To get it, at least at first, there's a preview event with a $100 cover charge come May. If you're going, do buy an extra and let us know because otherwise we'll be stalking eBay at 3 AM to get it at the last possible second. Click here for the full story. At last! After nearly a year in waiting, Droid Factory has finally launched at Star Traders in Disneyland Anaheim! MouseWait has the photo confirmation and big thanks to Yakface.com for the heads up! The Disney booth was ripe with activity as Celebrationers clamored for their Star Wars meets Mouse themed exclusives. Their Holographic Leia Vinylmation that was limited to 2,500 pieces sold out by Saturday. The biggest chatter of the year comes from Florida, where Droid Factory is being deployed at Disney Hollywood Studios. 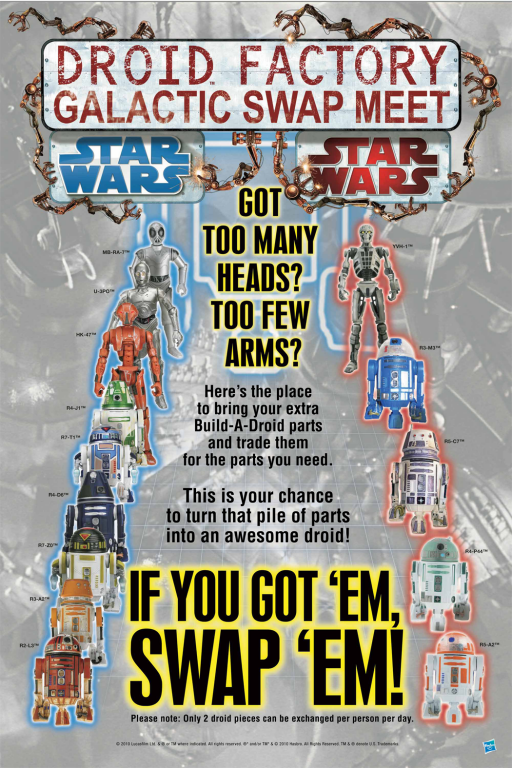 You can build your own Astromech Droid, but what does the whole set-up look like? Our pal Chuck sent us some awesome images over teh Twitter, and you can click through to see them (and follow him) after the break. First up, one of our pals on Twitter tweeted us last night that the Star Tours Astromech Droids would run about $12.95 each, or 2 for $18.95. This article shows more pictures of retooled heads and other changes, and the claim that only the R6, R8, and R9 heads are exclusive is something of a half-truth-- remember, the R5 droids appear to have no antennas this time around, plus all the droids have holes in their head. Galactic Hunter: The easiest and hardest question to tackle was partially answered at Celebration V. As collectors asked whether the Young Boba Fett's Slave I from The Clone Wars animated series would lead to Slave 1 from The Empire Strikes Back, the answer was simple and obvious —'Yes, if it sells well enough.' So there's an additional sales pitch! The question is, hypothetically (aside from paint ops) what changes could/would be made, and what figures (again hypothetically) would the team like to see included? This would be the perfect chance to get a mustachioed Bespin Guard out, or is he going to get the fully carded treatment?